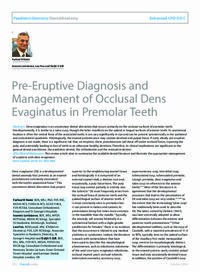 Abstract: Dens evaginatus is an uncommon dental aberration that occurs primarily on the occlusal surfaces of premolar teeth. Developmentally, it is similar to a talon cusp, though the latter manifests on the palatal or lingual surfaces of anterior teeth. Its anatomical location is often the central fossa of the associated tooth; it can vary significantly in size and can be present symmetrically in the ipsilateral and contralateral quadrants. Histologically, the enamel protuberance may contain dentinal and pulpal tissue. If early, ideally pre-eruptive diagnosis is not made, there is a significant risk that, on eruption, these protuberances will shear off under occlusal forces, exposing the pulp, and potentially leading to loss of teeth in an otherwise healthy dentition. Therefore, its clinical implications are significant to the general dental practitioner, the paediatric dentist, the orthodontist and the restorative dentist. Clinical relevance: This review article aims to summarize the available dental literature and illustrate the appropriate management of a patient with dens evaginatus. Author notes: Farhad B Naini, BDS, MSc, PhD, FDS RSC, MOrth RCS, FDSOrth RCS, GCAP, FHEA, FDS RCSEd, Consultant Orthodontist, Kingston and St George’s Hospitals, Ioannis Levisianos, BDS, MSc, MFDS RCPS(Gla), MOrth RCS(Eng), Specialist Orthodontist, Edinburgh, Scotland, Lee Foo, BDS(Lond), MSc (Children’s Dentistry), FDS, LDS RCS(Eng), Associate Specialist in Paediatric Dentistry, St George’s Hospital and Daljit S Gill, BDS, BSc, MSc, FDS RCS, MOrth, FDS(Orth) RSC(Eng), Consultant Orthodontist and Honorary Senior Lecturer, Great Ormond Street Hospital and Eastman Dental Hospital, London, UK. Objective: To understand the importance of early, ideally pre-eruptive radiological diagnosis, clinical and restorative implications and management of patients presenting with occlusal premolar dens evaginatus anomalies.